Andrews McMeel Publishing, 9780740791093, 96pp. 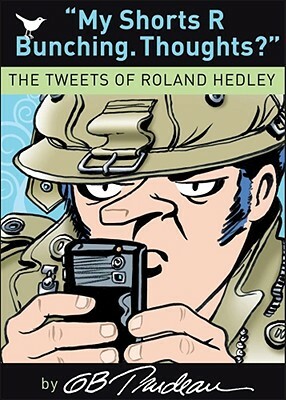 In March of 2009, Doonesbury's intrepid journalist Roland Burton Hedley, III, opened a Twitter account and began to tweet. A lot. Four weeks later, a sampling of his 140-character missives was published in The New Yorker to great acclaim, and his posts were featured in a one-on-one "tweet-off" in the Columbia Journalism Review. Rushed into print, this groundbreaking volume is the first book-length Twitter collection by a single author. With dozens of Doonesbury strips and over 500 tweets, it presents the best of Hedley's work -- frontline micro-blogging from the self-anointed dean of Washington journotwits. Eight months into this project, author G.B. Trudeau can confirm that Twitter is a colossal sinkhole of time, but is gratified that he has found a way to monetize Roland's inane postings. (Follow Roland_Hedley.) When not writing comedy haiku on Twitter, Trudeau writes and draws the Pulitzer-prize-winning comic strip Doonesbury for 1100 newspapers worldwide, and lovingly curates his web presence at Doonesbury.com. He also hosts a milblog called The Sandbox.